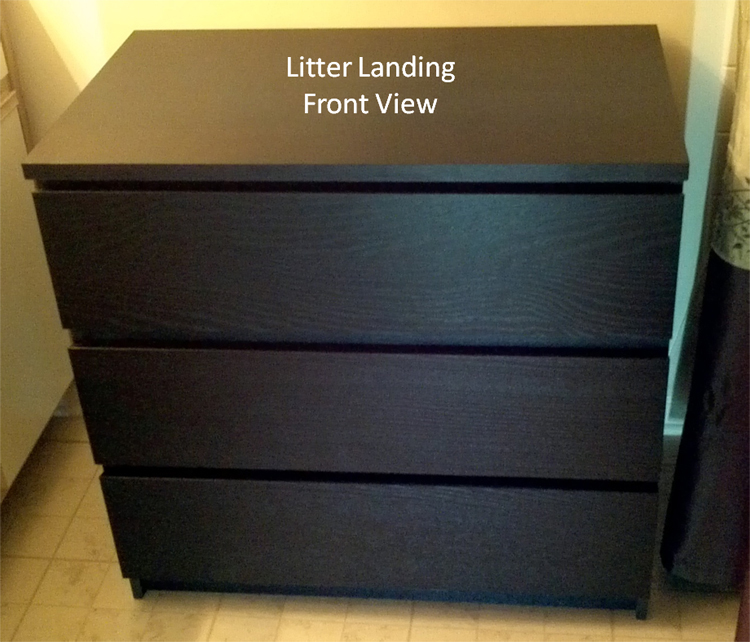 The "Litter Landing" provides litter box concealment and much more inside a stylish 3-drawer type wooden cabinet. 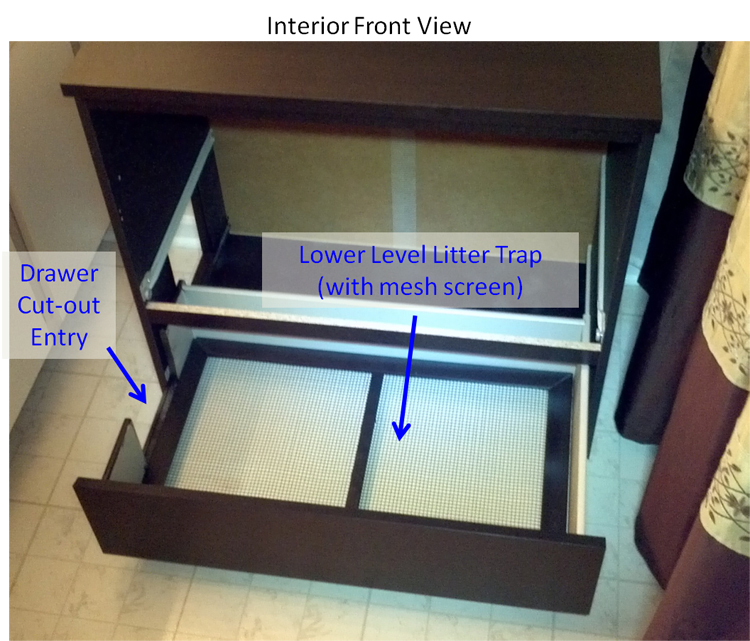 Our patent pending 2-level mesh screen litter trapping concept virtually eliminates litter tracking outside the cabinet by effectively removing litter from your cat's paws before it exits. 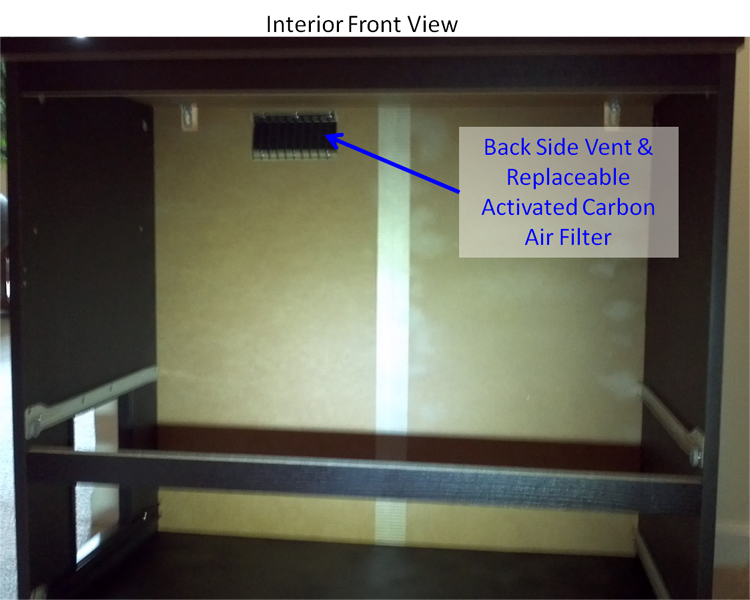 Activated carbon filters help to contain odor, and removable drawers provide for easy cleaning. 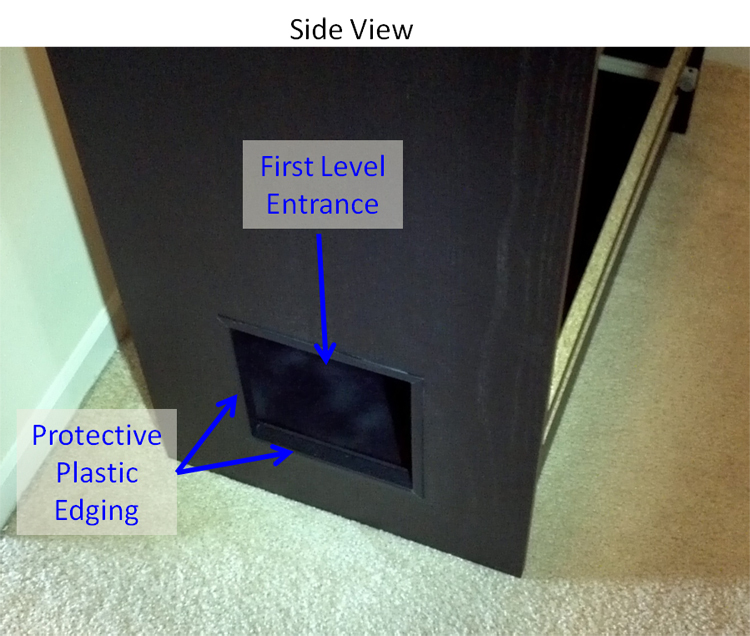 The entry door is located on the lower level of the cabinet, which has a removable medium-mesh flooring throughout. To reach the litter box the cat enters the cabinet and walks across the lower level to the opposite end. 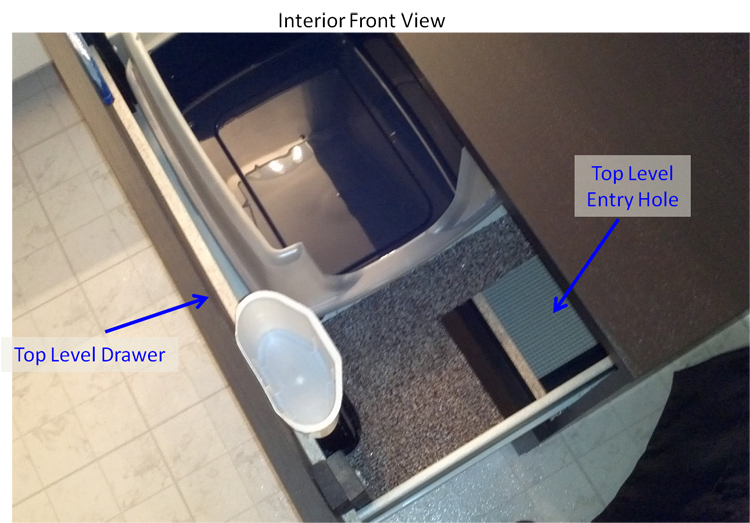 There it jumps upward through an opening to a ledge on the upper level where the litter box is located. 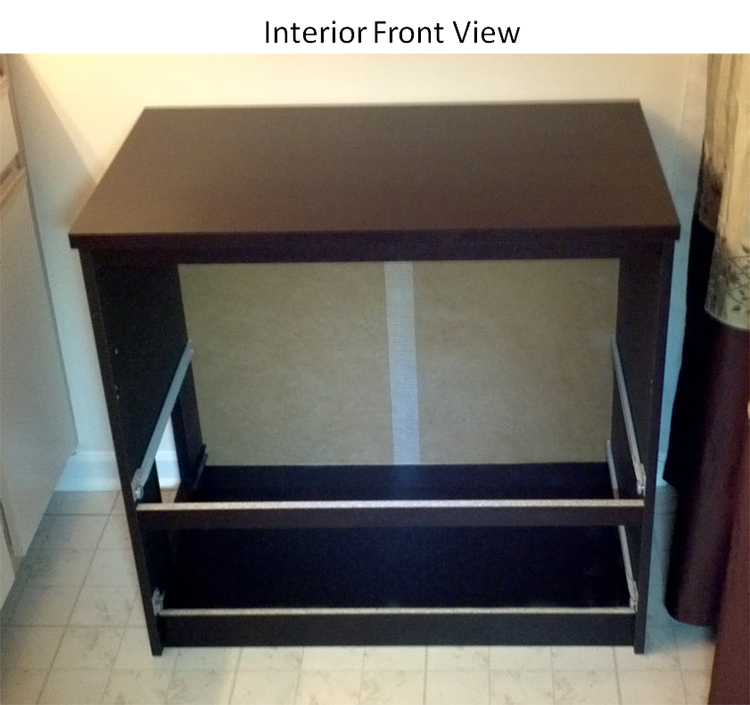 The cabinet comes with a high-walled litter box, which helps to keep litter from being kicked out by the cat. 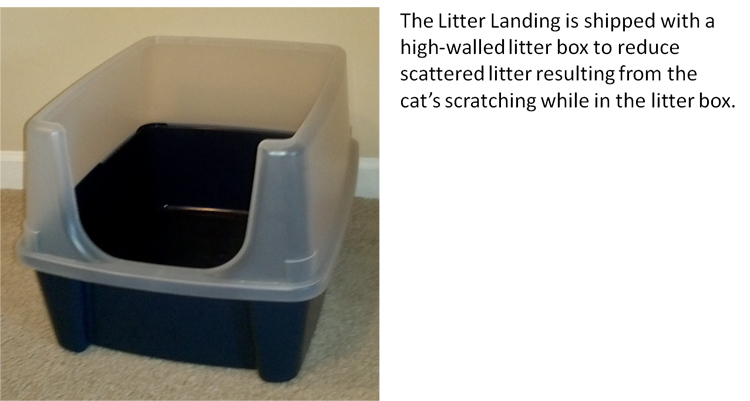 When finished using the litter box, the cat steps first onto the upper level turf, cleaning some litter from its paws. 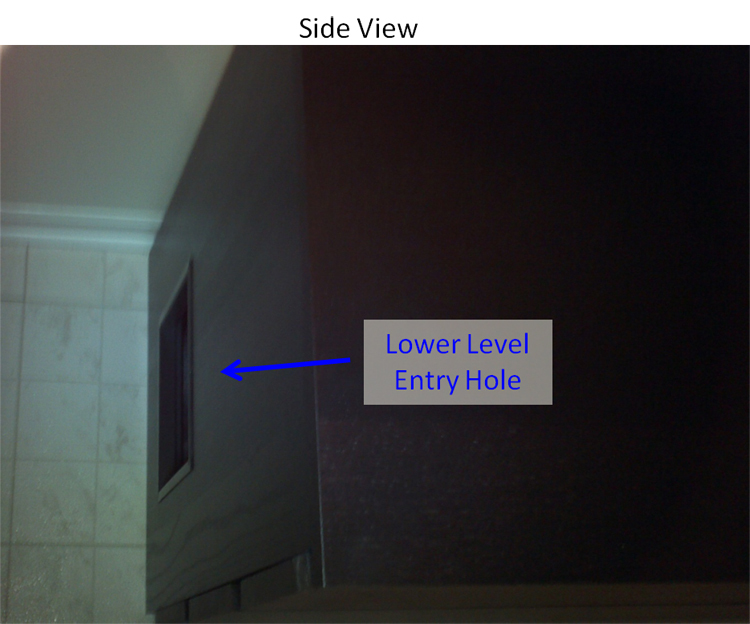 Then it jumps back down through the opening to the lower floor on its way to the exit. 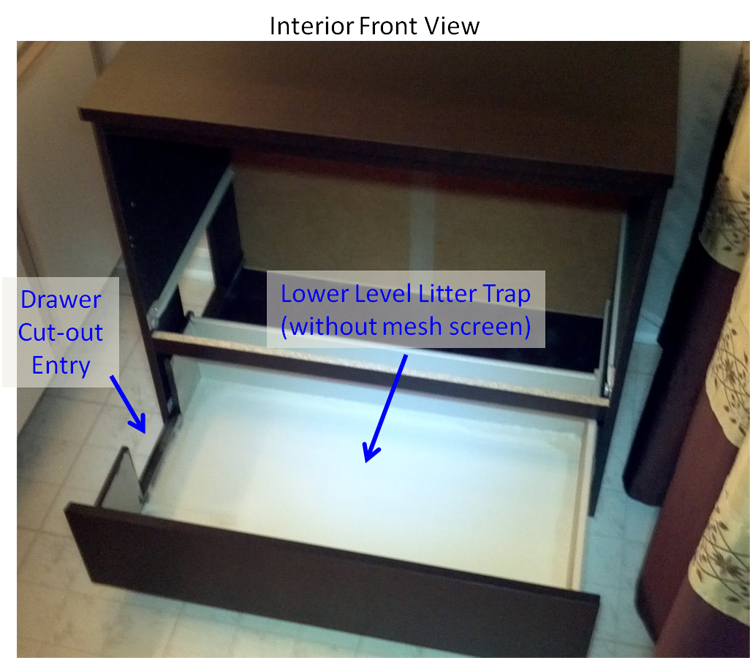 The force of the cat's motion upon landing on the lower level grating causes its toes to spread apart, and knocks loose most of the remaining litter from the cat’s paws so that it can fall through the mesh floor into the protected and sealed drawer space below. 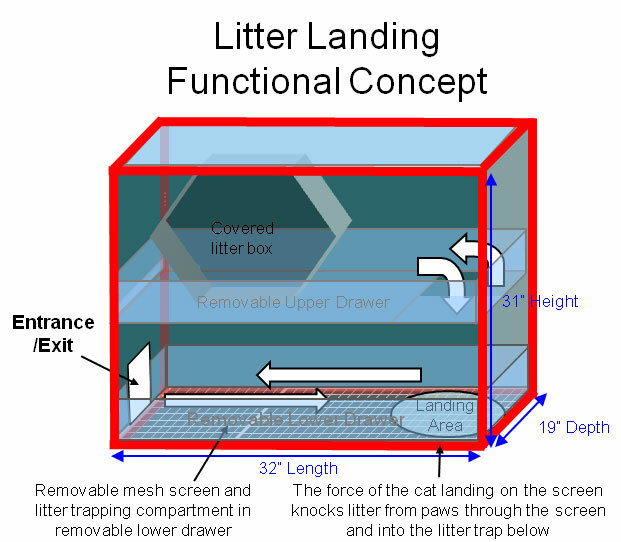 As the cat walks the remaining distance to the exit, virtually all of the remaining litter falls off its paws and through the mesh floor. 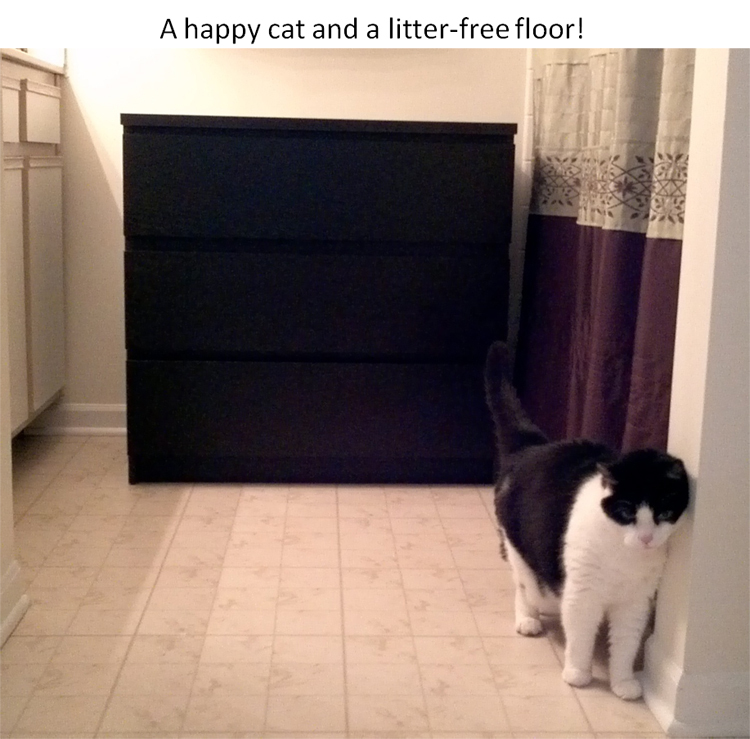 This process effectively cleans your cat’s paws and greatly reduces litter being tracked outside the box and onto your floor. 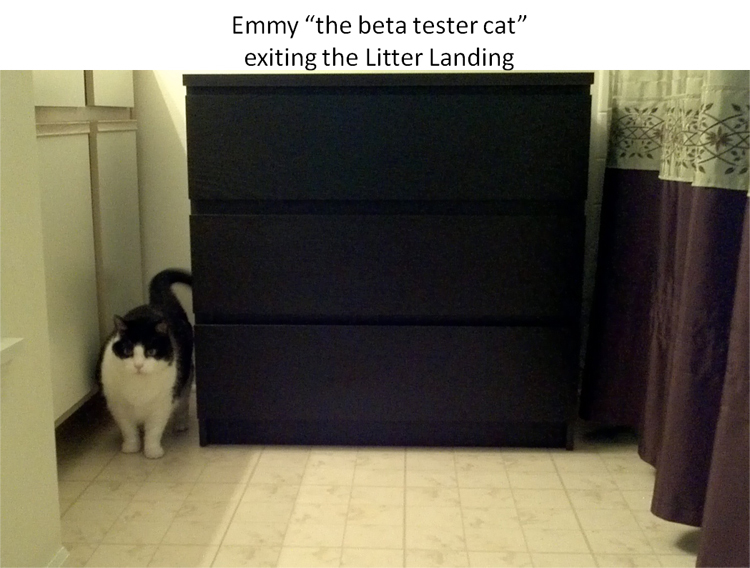 The Litter Landing is made from a commercially available 3-drawer cabinet, which we modify into an effective litter box enclosure. 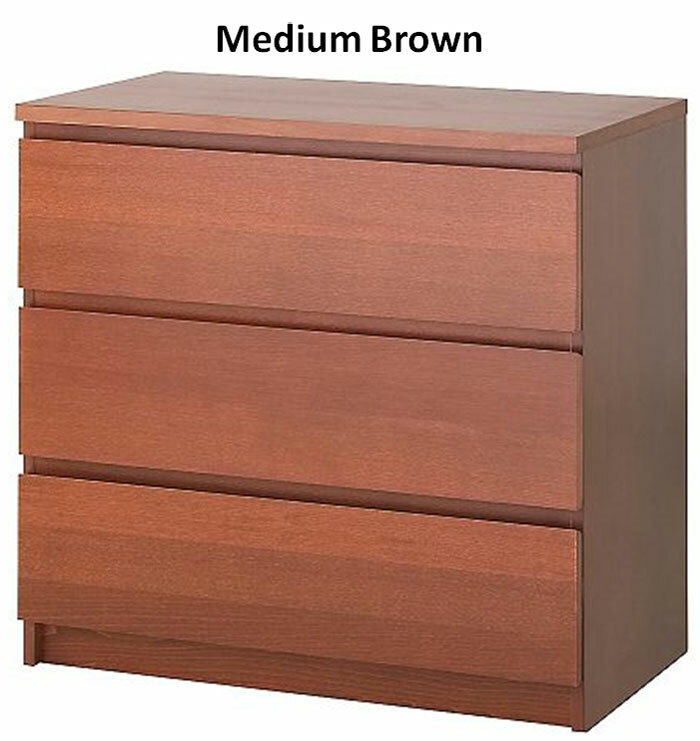 While it appears to contain 3 drawers it actually contains only 2. 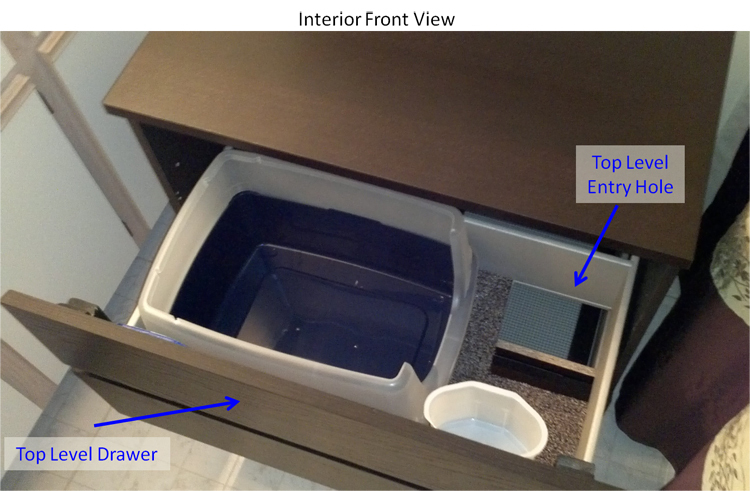 The upper space where the third drawer would be located is open, allowing plenty of room for your cat to move around. 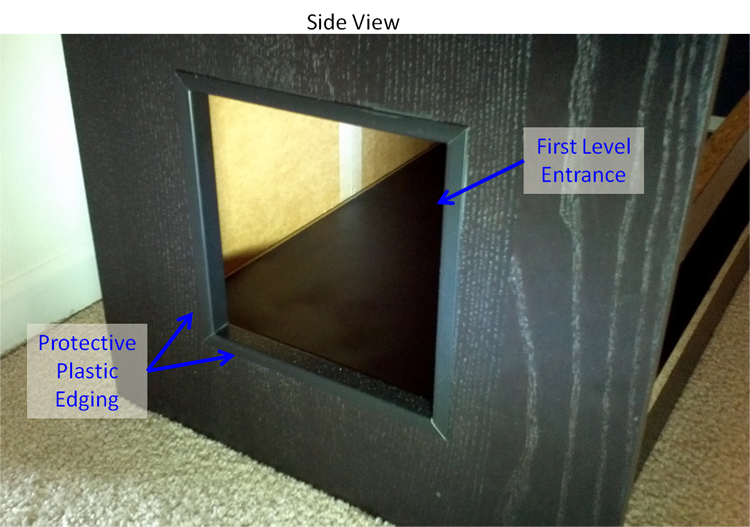 Both the entry door and the vertical opening between the two levels are large enough for even big cats to fit through. 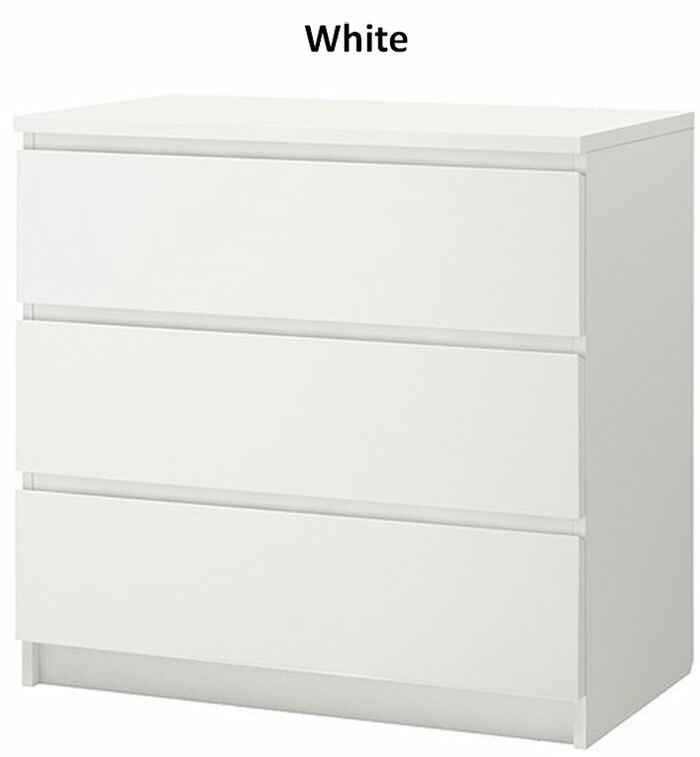 The cabinet is constructed from MDF wood, which holds up better under moisture than solid wood. 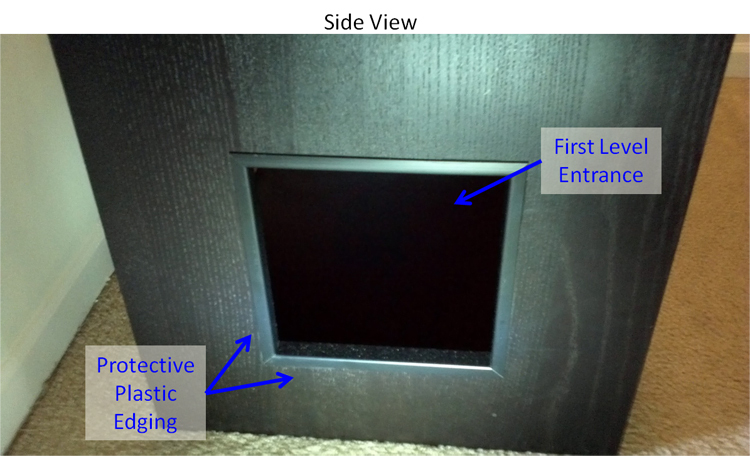 In addition, all interior wood surfaces are coated with a rubberized sealant to prevent absorption of liquids that may get splashed on them. 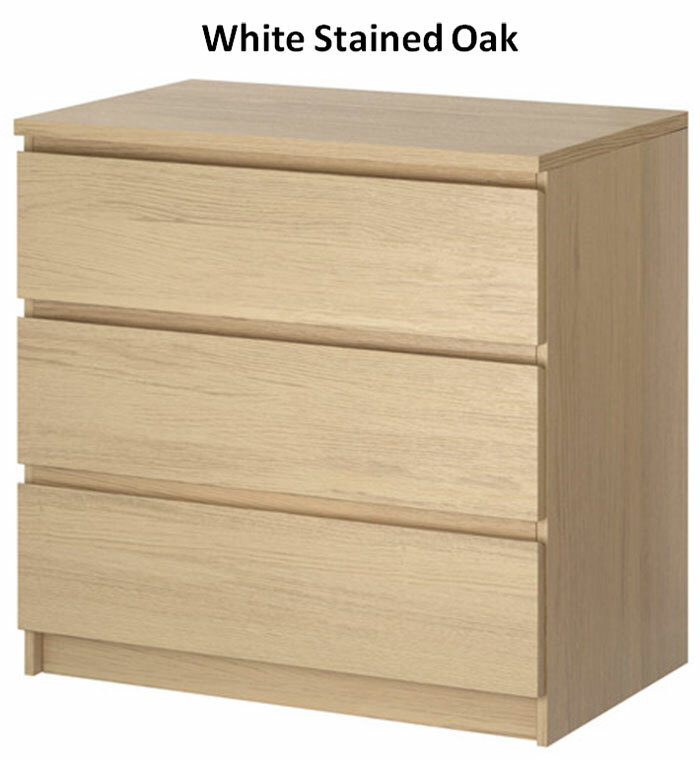 The coating also prevents smells from seeping into the wood. 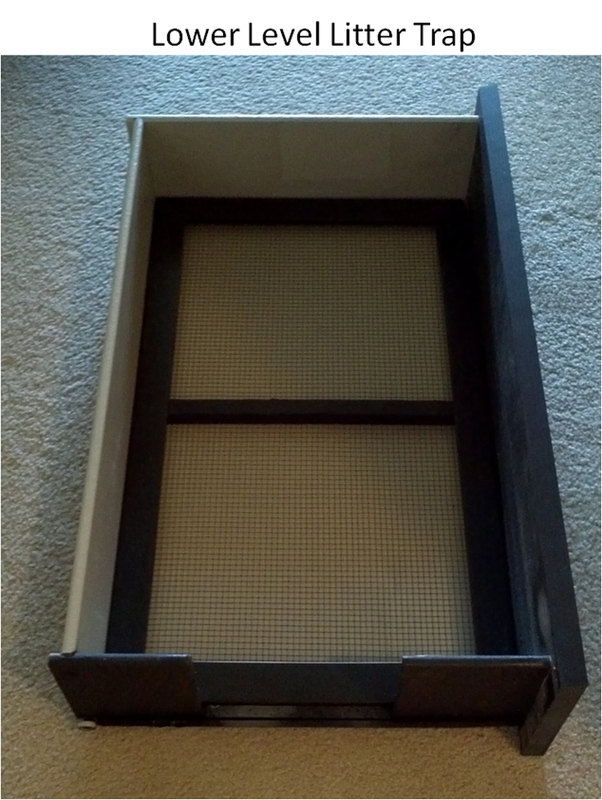 The mesh flooring on the lower level is easily removable and the lower drawer itself can be removed without difficulty for easy clean out. 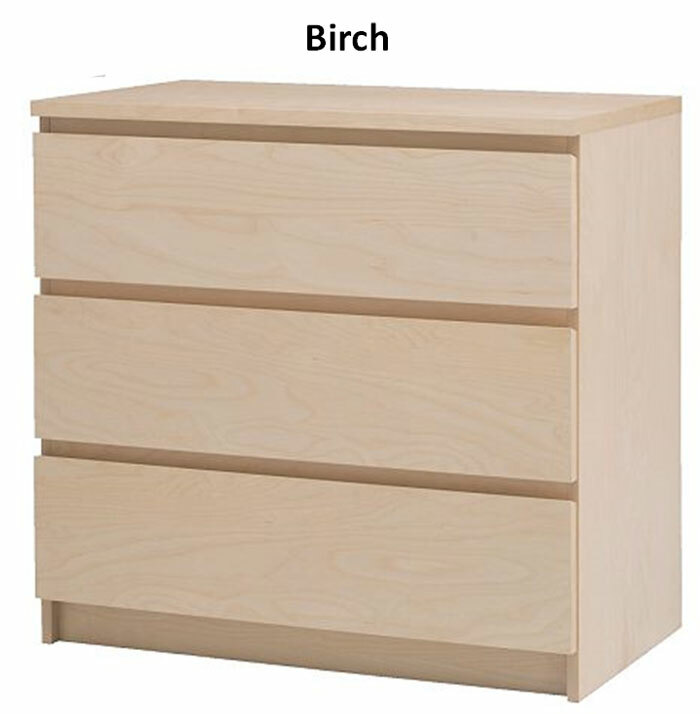 Because the drawer is coated with a rubberized sealant, any litter and/or liquids that accumulate there can be quickly dumped into a trash can or wiped clean with a cleaning cloth such as Clorox Wipes or other mild household cleaners. 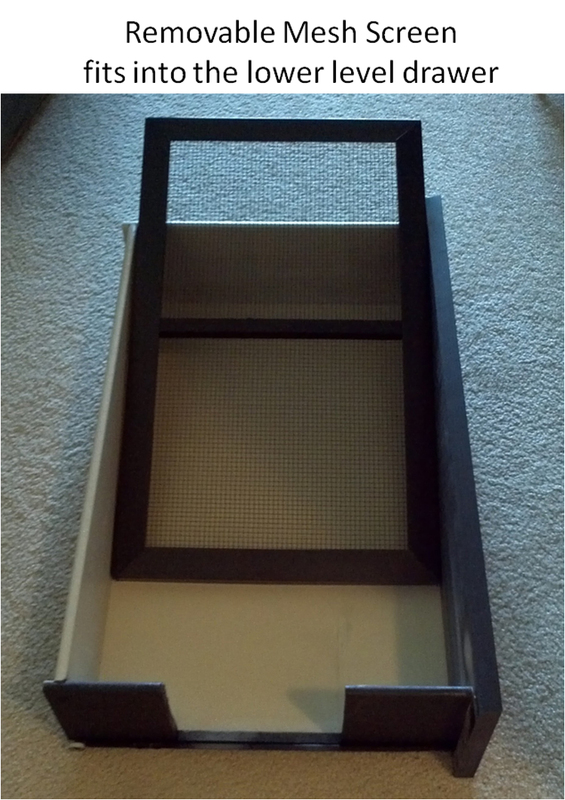 The second level drawer is also easily removable and coated with a rubberized sealant. 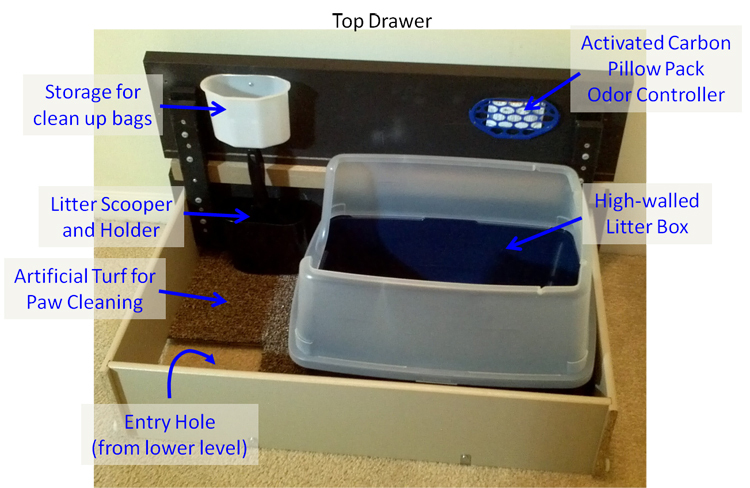 Small amounts of litter and/or liquid may get on the floor of this upper drawer, but can be easily dumped in a trash can or cleaned, just like the first level drawer. 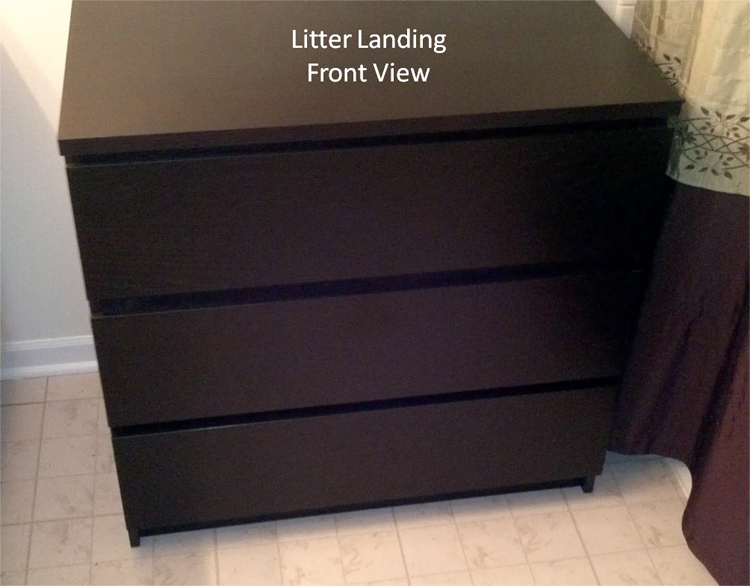 A removable floor panel sits beneath the first level drawer to catch litter that gets scattered outside the drawers. This panel is sealed and easily removed and cleaned. 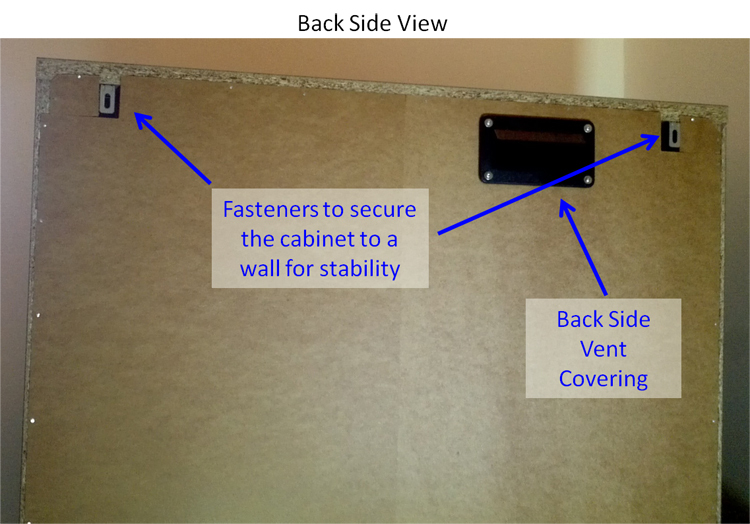 A vacuum cleaner may be used to quickly remove any litter accumulated on the panel as well. Odor control is accomplished in 4 ways. 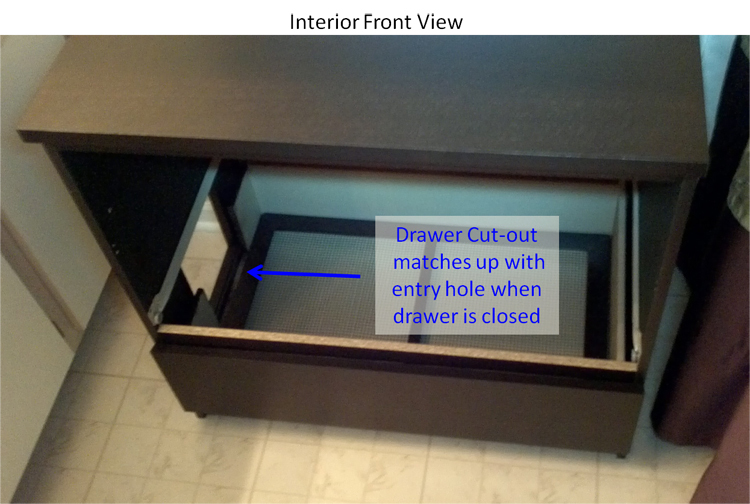 First, when the drawers are closed the cabinet is sealed well enough that air is mostly prevented from leaking around the drawer edges. 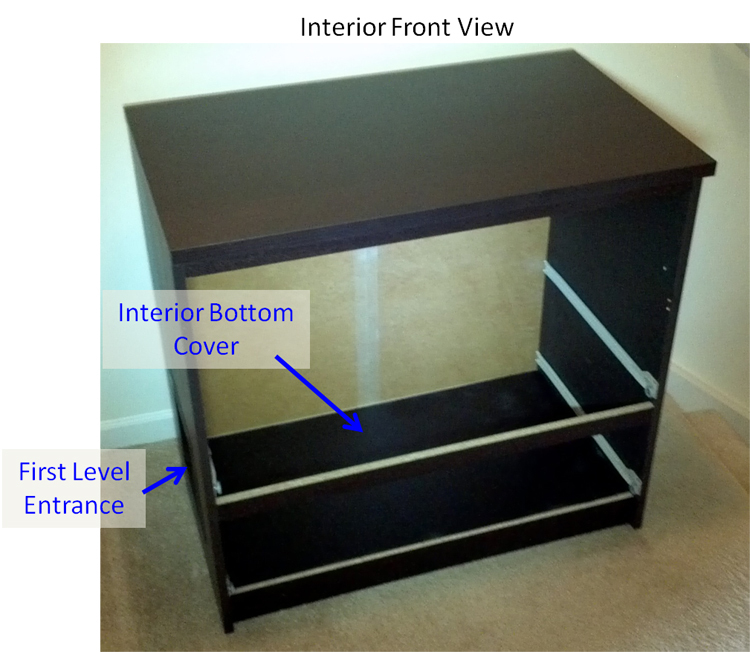 Second, rubberized sealant on all interior wood surfaces prevents the wood from absorbing and holding onto odors. 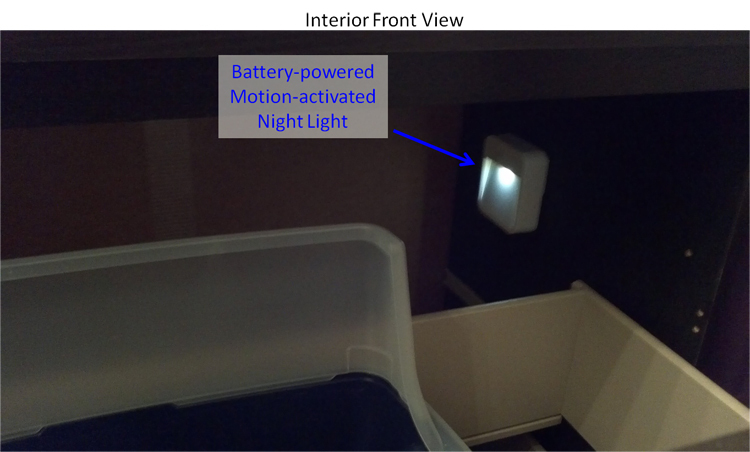 Third, inside the cabinet near the litter box location is a small holder for an activated carbon pillow pack. 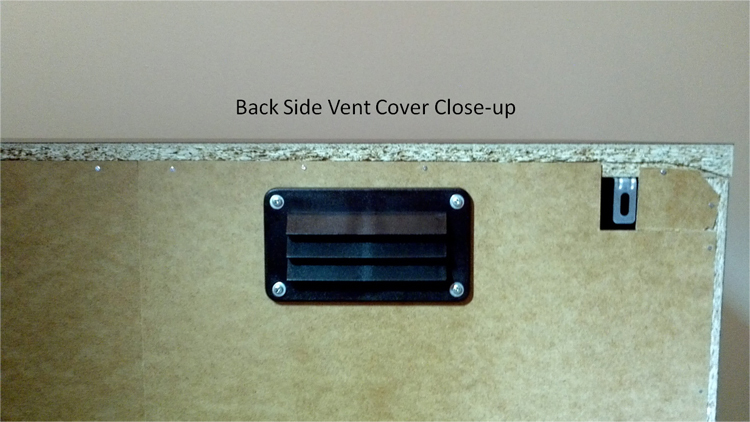 Use of this feature will help to eliminate the bulk of odors. 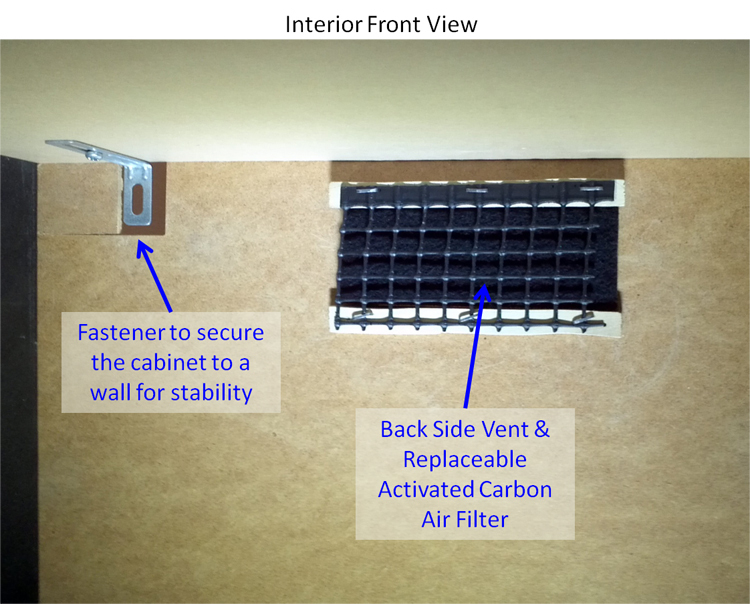 Fourth, a small vent opening on the cabinet’s back side is covered by an activated carbon fabric air filter that removes odors from air passing through it. 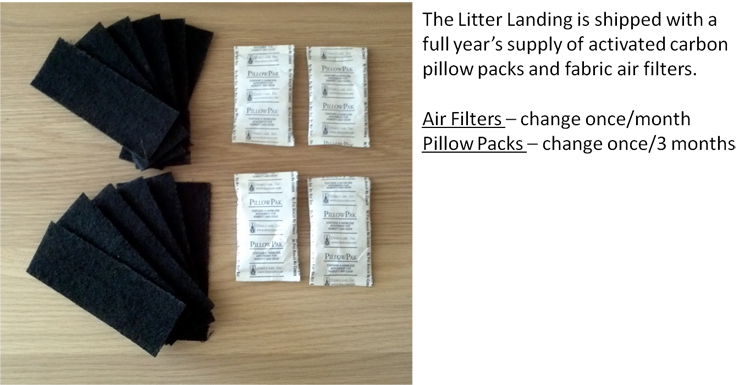 The Litter Landing ships with a 1-year supply of 4 activated carbon pillow packs (10g each) and 12 activated carbon air filters. The pillow packs are long lasting and should be affective for at least 3 months each. 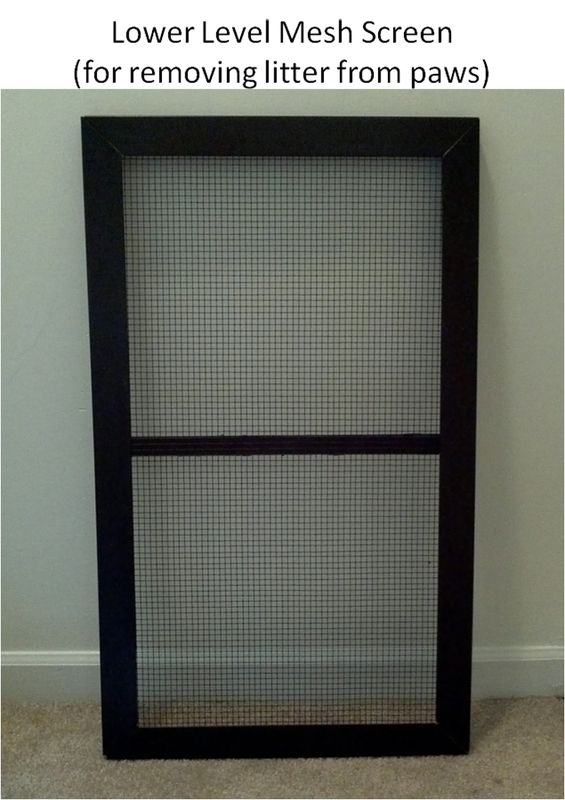 The cloth air filters can be changed monthly. 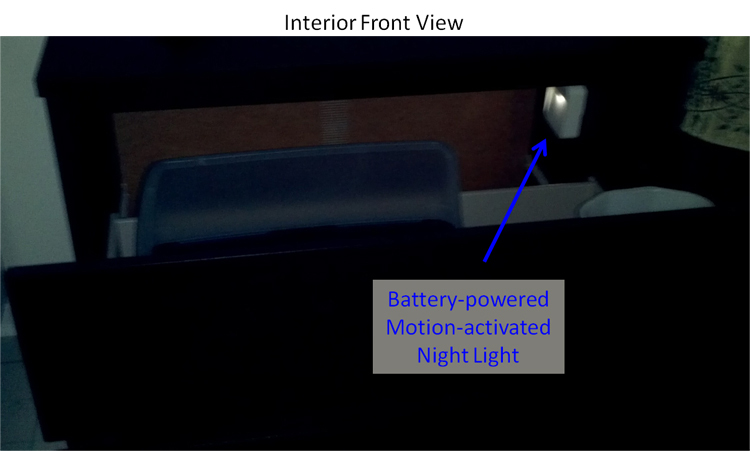 Because the interior of the cabinet may be dark, especially at night or in a dark room, we have mounted a small battery-powered motion-activated nightlight inside. 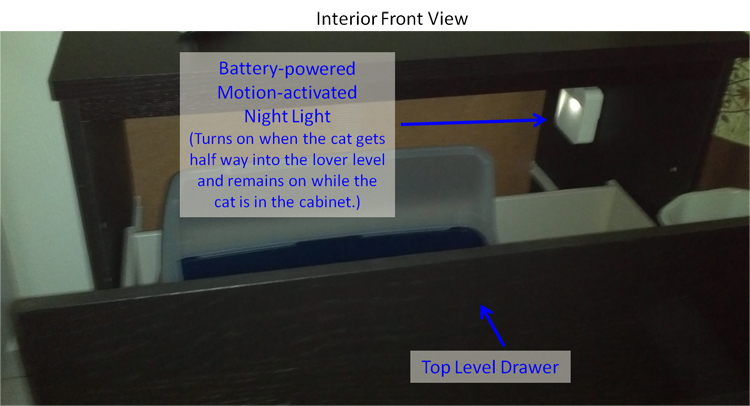 When triggered by your cat’s movements, the light will supply illumination to both the lower and upper levels. 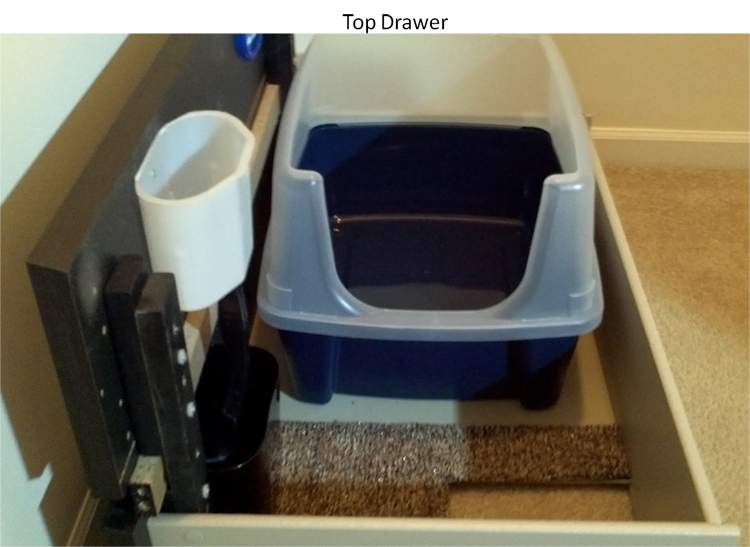 The Litter Landing ships with an open top, high wall litter box chosen to keep the cat from kicking litter out of the box and onto the upper drawer surface, yet still provide plenty of head room and space to maneuver. 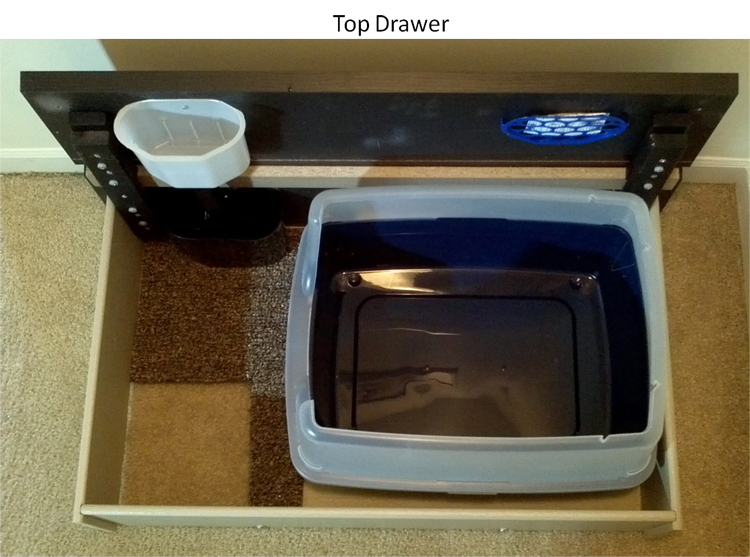 For larger cats the cabinet can accommodate larger litter boxes up to 21" (L) x 16" (W) x 15" (H). 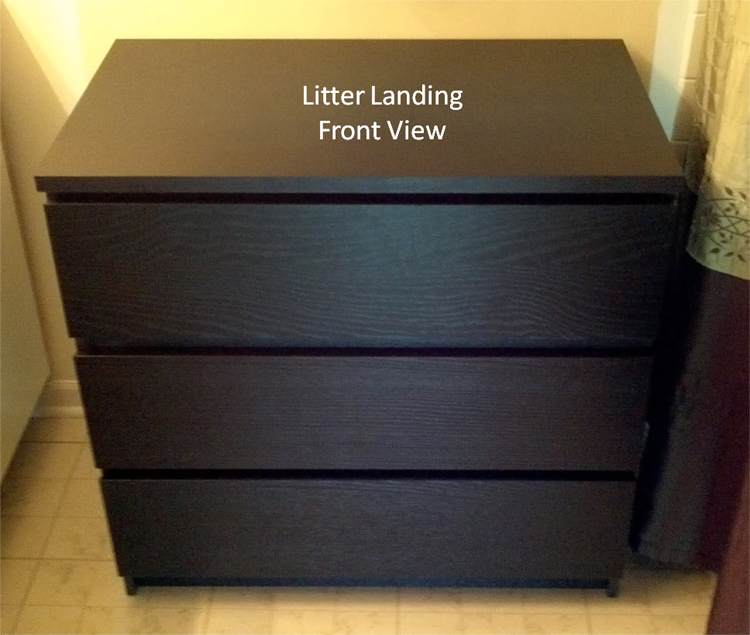 A litter scooper and holder are mounted inside against the top drawer's front wall. 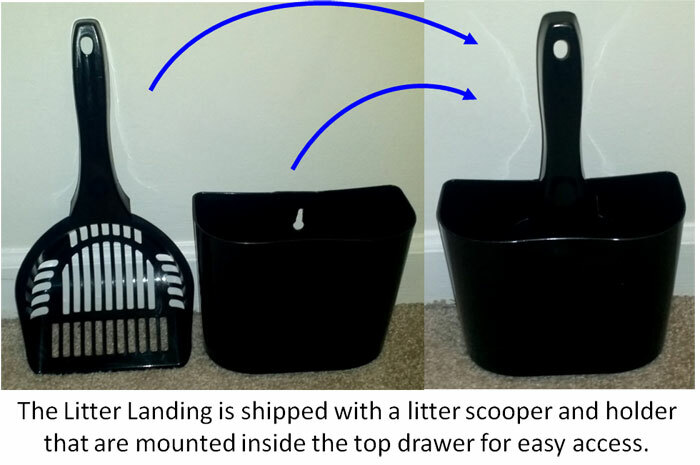 Also, a small container for clean up bags is mounted next to the litter scooper.